proposed for dealing with over-currents during steady state. open phase condition were carried out. D. Foito, J. Maia, V. Fernao Pires, J. F. Martins, “Fault diagnosis in six-phase induction motor using a current trajectory mass center”, Measurement, Vol. 51, May 2014, pp. 164-173. A. Nanoty, A. R. Chudasama, “Control of designed developed six phases induction motor”, International Journal of Electromagnetics and Applications, Vol. 2, 2012, pp. 77-84. A. Nanoty, A. R. Chudasama, “Design, development of six phase squirrel cage induction motor and its comparative analysis with equivalent three phase squirrel cage induction motor using circle diagram”, International Journal of Emerging Technology and Advanced Engineering, Vol. 3, Iss. 8, August 2013, pp.731-737. G. Grandi, A. Tani, P. Sanjeevikumar, D. Ostojic, “Multi-phase multilevel AC Motor drive based on four three-phase two-level inverters”, International symposium on power electronics electrical drives automation and motion, 2010, pp. 1768-1775. R. Gregor, F. Barrero, S. L. Toral, M. J. Duran, M. R. Arahal, J. Priesto, J. L. Mora, “Predictive-space vector PWM current control method for asymmetrical dual three-phase induction motor drives”, IET Electric Power Applications, Vol. 4, Iss. 1, 2010, pp. 26-34. P. Nagaraj, V. Kannan, M. Santhi, “Modified multiphase induction motor with high starting torque”, International journal of Innovative Research in Science, Engineering and Technology, Vol. 3, Iss. 3, March 2014, pp. 519-522. M. J. Duran, I. Gonzalez, M. Bermudez, F. Barrero, H. Guzman, M. R. Arahal, “Optimal fault-tolerant control of six-phase induction motor drives with parallel converters”, IEEE transactions on industrial electronics, 2015. H. Guzman, I. Gonzalez, F. Barrero and M. Durán, R. Gregor (Ed. ), “Open-Phase Fault Operation on Multiphase Induction Motor Drives, Induction Motors - Applications, Control and Fault Diagnostics”, InTech, November 2015. P. S. Bhowmik, S. Pradhan, M. Prakash, “Fault diagnostic and monitoring methods of induction motor: a review”, International Journal of Applied Control, Electrical and Electronics Engineering, Vol.1, iss. 1, May 2013. ISNAD PITRĖNAS, AURELIJUS , UZNYS, DONATAS , BEIŠTARAS, DOMINYKAS . "Production of Circular Stator Current Trajectory in Multi-Phase Induction Drive Under Open Phase Fault Condition". 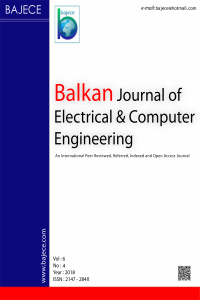 Balkan Journal of Electrical and Computer Engineering 5 / 1 (February 2016): 1-4.